Prevent a wide range of troubles under low-temperature environment. Both humans and forging dies require sufficient warming up when performing strenuous work. 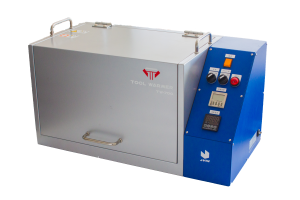 Tool warmer™ can raise the temperature of forging dies prior to usage easily and in a short amount of time, which enables avoidance of troubles that are likely to occur at the beginning of operations especially during the winter. Application has also expanded as a device for conducting lubricating treatment on forging dies. Reduces variations in product dimensions and shapes at the time of initial processing. Prevents sudden damage to dies that occur at low temperatures. Stabilizes the longevity of tools. For lubricating treatments based on heating. Compact and light enough to be transported on an ordinary dolly. The large interior capacity allows simultaneous warming of multiple molds. Just insert the object to be warmed and operate the switch. Heating ON/OFF can be set with a timer as well. Sensors prevent overheating. The interior is lined with metal for safety even if a workpiece should explode. The structure is designed to prevent oil or moisture outflow. Warming is possible with an ordinary power outlet. Low power consumption also helps keeps costs lower than with typical heaters.